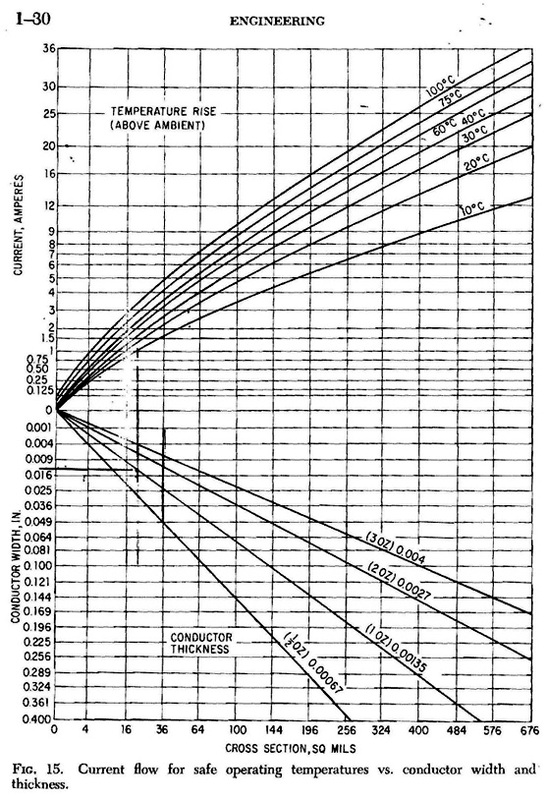 The chart shown below will help you determine safe levels of current carrying capacity, in amperes, for different trace widths and thicknesses. First determine the amount of current specified on the top left side of the graph. Then move horizontally to the right until you intersect a reasonable temperature rise from the ambient. At that point move vertically on the graph downward toward the copper thickness specified for your circuit board. At the point where the vertical line crosses the thickness of copper move horizontally to the left until you reach the conductor widths. At this point you have determined a trace width that will comfortably carry the specified current and know the temperature delta from the ambient.